I get asked a lot what the healthiest sweetener is and my answer is always any sweet whole food still pretty much in it’s original form. I think anything that’s been extracted and heavily processed and preserved isn’t going to be anywhere near as healthy as a whole fruit such as dates. Dates are so good for you as they contains loads of vitamins and minerals such as calcium, iron and magnesium and are great for constipation and weight loss. A perfect post-holiday addition to your diet! 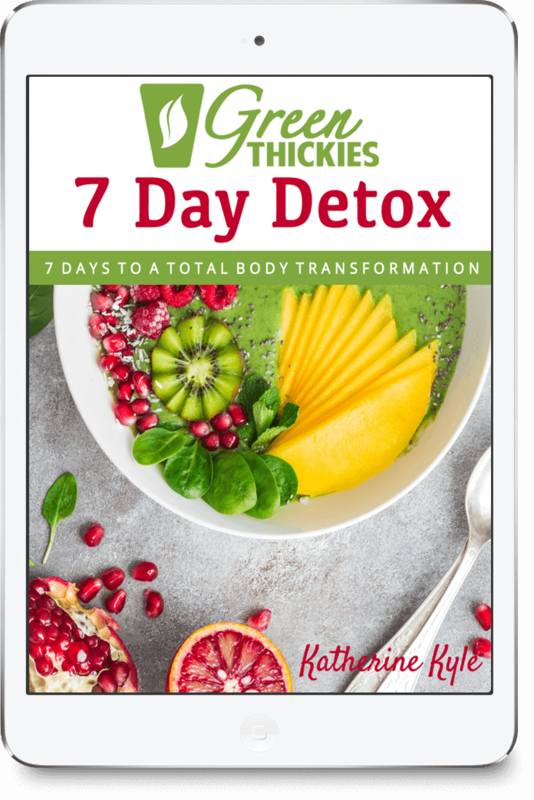 This is my 100th post on my website and I’m excited about the fact that I’ve also just had the 1000th person sign up for updates via email and the Green Thickies Facebook page has also just reached 1500 likes. So I wanted to thank all of you for your support and want to try and give more time back to my website now that I’m feeling a bit better and into the second trimester of my pregnancy. 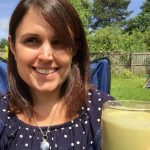 (If you haven’t already you can read why I had to stop drinking green smoothies during my pregnancy). 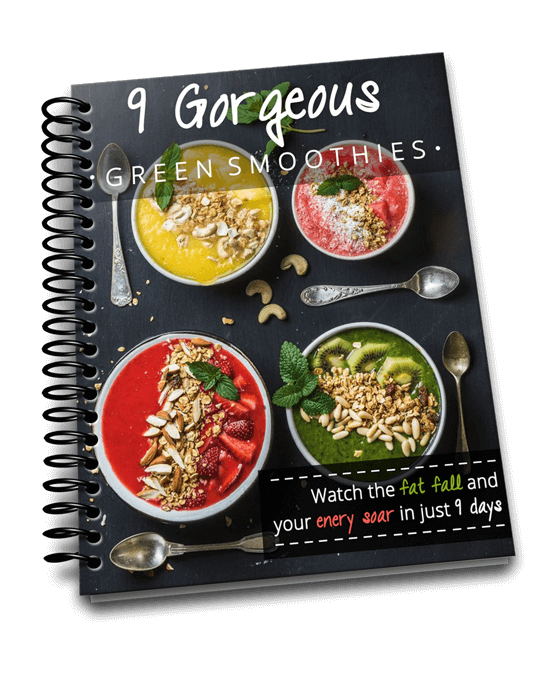 Don’t worry I’m almost at the stage where I’m ready to start drinking green smoothies again and I have loads of lovely recipes that I’ve already created just waiting for me to share with you. I also want to start posting more recipes about making individual ingredients that you can add to your smoothies such as coconut milk, almond milk, coconut butter, peanut butter and healthy sweeteners. So what better way to start the new year than with a healthy way to sweeten all your recipes. Enter the date paste. 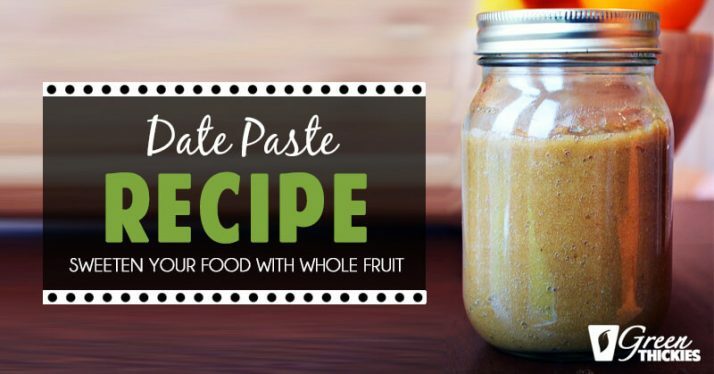 I used to put whole dates, raisins or any dried fruit straight into my smoothie but now I generally just use Date Paste. This is also referred to as date syrup or date honey. It is basically just pureed dates. You can buy it which saves you the hassle of making it but it won’t be as fresh as making it yourself. I like to make my own as it’s cheaper and healthier. It also blends much easier and saves time pitting dates every time you make a smoothie. Use a blender: You may need to use quite a lot of water with the dates, and this is easier with high speed blenders. Use a food processor which uses less water than a blender but the date paste won’t be as smooth. Use a pestle and mortar: This is great for small quantities of date paste but requires a bit more effort. Hob method: Simmer pre-blended date paste in a pan to reduce the amount of water content in it, or you can simmer first and then process once it’s cooled. Use a fork: See my previous Date Syrup recipe for instructions on how to leave your date syrup to pretty much make itself in the fridge! Use any type of dates that you like but make sure there are non added ingredients as sometimes dates are coated with syrup to make them look shiny. Fresh whole dates are the healthiest as they are the freshest but personally I use dried pitted dates as I get through so many of them. I buy them in bulk on Amazon. If you are making baked goods I would replace the liquid sweetener with exactly the same amount of date syrup as it may alter the consistency if you change the quantity of wet ingredients. However for other recipes you might be able to experiment with the quantity a bit more. 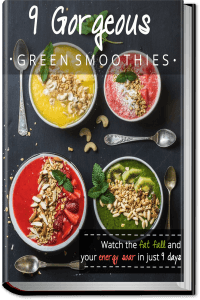 For smoothies and recipes where it’s easy to adjust the amounts I would just add the date paste to taste. The date paste is watered down with water so it may not be quite as sweet as other sweeteners, so you might need to add more if you want it a bit sweeter. My green thickie recipes usually call for between 1/4 and 1/2 a cup of dates. I would add in exactly the same amount of date paste but you can easily adjust this. 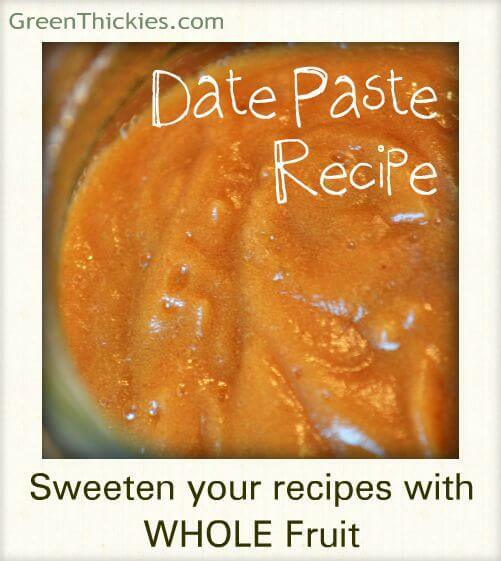 Date paste is one of the healthiest and most economical sweeteners you can make at home. Plus it’s extremely easy and quick to make. Soak the 2 cups of dates in 2 cups of water overnight or for at least 8 hours. Keep the soaking water for the recipe. Drain the dates but reserve the water and add them to the food processor with just enough water (start with 2 tablespoons) and process until it’s as smooth as you can get, scraping down the sides as needed. Add just enough dates for the recipe you need with a splash of water if required. Use some muscle power to grind the dates into as smooth a paste as you can manage. If you want your finished date paste to include less water you can either blend the dates with the soaking liquid in a blender then simmer in a saucepan until the paste has reduced. Or you can add the dates with the liquid straight to the pan, simmer until the water has reduced and then leave to cool and process with the food processor until as smooth as you can get it. Thank you, it’s so much healthier than sugar and doesn’t give me a sugar high then a crash. That’s great, let me know how it goes. Just make sure you’ve got enough water so you don’t burn your blender out. I have to be careful even with my vitamix but I prefer less water and more dates so tend to try and make it a bit thicker. Congratulations on your blog milestones! I’ve made chocolate date paste in the past, and used it to sweeten pumpkin bread and it was super tasty. Your variations look great! Thank you Danielle. Chocolate date paste sounds gorgeous. I bet I could make that would carob and I’m sure my baby would love that! Congrats darling!!! Big day for your blog! Love it – it takes so much work and love and time to make our little virtual spaces successful.. good on you!! Thank you Kristy, that’s very kind of you. Yes there’s so much work that goes into a blog, much more going on behind the scenes than people might think. So it’s lovely when people get benefit from all the hard work you’ve put in. You should give the date paste a go, it’s great in so many recipes. What a brilliant idea! Thanks for sharing your tip with the Hearth and Soul Hop. I’ve pinned this to my Pinterest board. I need to explore with dates! What a great sweetener! Thanks for the reminder that I need to make more date paste! It’s been awhile. Thanks for sharing with Simple Meals Friday! I hope you join us agian this week. Glad you’ve already discovered the joys of date paste! I’d love to make this! Dates are so sweet and tasty. Is there a type of date you recommend like medjool for example? Just asking because some dates are more pricy than others. Hi Dana, to be honest I buy my dates dried and pitted in bulk via Amazon. I get through so many of them and I find this is the cheapest option. Dates are healthier when they are fresher and pitted though but it would cost me a fortune to buy those so we’ve just got to get the best foods we can within our budgets. Can date paste/date honey be used directly as a spread on fruit, cheese, bread or crackers? I have lots of ideas…I wonder how that would work? I want to make date paste so badly, I never knew you could. Sounds like a wonderful alternative sweetener to some of the ones I use. How do you measure the dates? By weight (16 oz.) or just put some in a measuring cup? Thank you, this is one I will keep and use in my thickies!! I didn’t weight the dates I just used a measuring cup. I hope you liked the date paste. I find it so flexible as I can use it in everything! Is the date syrup or past suitable for diabetics? Hi Patti, you’d really need to discuss that with your doctor, it is very high in natural sugars. How does it taste in coffee? I don’t drink coffee but I’d assume it would taste pretty nice! 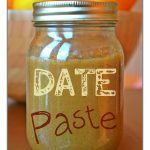 How long does date paste last? Shelf life? I’m not sure exactly but I’d probably keep it less than 3 weeks or when it starts to look off.